Lewes is a very nice little town as this view of part of High Street shows. The town is built on and around a hill and this part of High Street is at the top but the street continues down the fairly steep hill to the level of the River Ouse at the bottom which is in the area known as Cliffe. 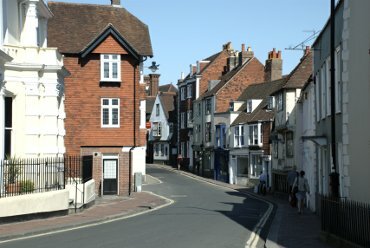 High Street becomes very narrow at this point such that traffic flow is controlled in each direction by traffic lights. We stayed at the Blacksmiths Arms in Offham for the duration of our visit to Lewes in June 2009. This part of High Street, at the junction with Market Street, is where it starts to go downhill as you can see from the view ahead. High Street follows an original Saxon trade route and Market Street is just out of the left edge of the picture. 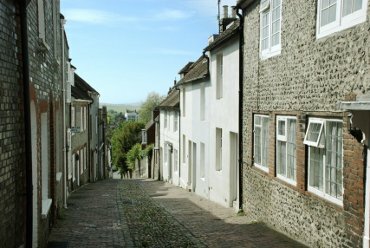 Keere Street, built around 1272, runs from High Street down to Southover and is one of a number of 'Twittens' in the town. 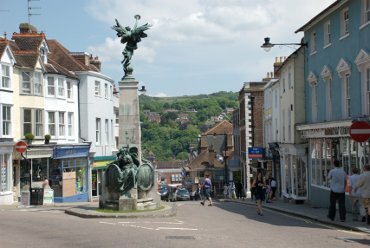 Southover used to be a separate village but is now part of Lewes. There is a 15th century timber-framed building on the top corner of Keere Street at the junction with High Street which is now used as a bookshop. 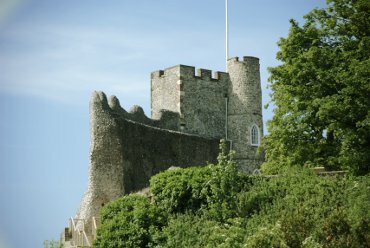 The building of Lewes Castle was started soon after 1066 but wasn't finished for 300 years and the castle is unusual in that it has two mottes (mounds) associated with one bailey (the walled castle). This view is of the Keep atop one of the mounds seen from the Barbican Gate. 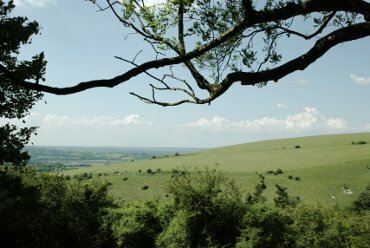 A view on the downs above Lewes showing Malling Hill. The downs may be accessed from a number of locations; Chapel Lane being one of them. The path from Chapel Lane eventually runs alongside the edge of The Combe, the steep sided valley at the bottom of the picture, with Malling Hill on the other side.